This report examines the social and political views of Muslims around the world. It is based on public opinion surveys conducted by the Pew Research Center between 2008 and 2012 in a total of 39 countries and territories on three continents: Africa, Asia and Europe. Together, the surveys involved more than 38,000 face-to-face interviews in 80-plus languages and dialects, covering every country that has more than 10 million Muslims except for a handful (including China, India, Saudi Arabia and Syria) where political sensitivities or security concerns prevented opinion research among Muslims. Collecting and analyzing this trove of data was a massive endeavor, and the Pew Research Center’s Forum on Religion & Public Life has published the results in stages. In August 2012, we released a report (“The World’s Muslims: Unity and Diversity”) that focused on the survey’s findings about religious beliefs and practices. It showed that while there is much commonality of belief among Muslims around the globe on some key tenets of their faith, there also are substantial differences in interpretation and levels of observance. Unity and diversity also emerge as important themes in this second report (“The World’s Muslims: Religion, Politics and Society”). Pew Research’s global survey of Muslims analyzes opinions on a wide range of topics, from Islamic law and science to popular culture and the role of women. It also looks at Muslims’ views on religious extremism and religious conflict in their country. Finally, the report takes advantage of prior Pew Research surveys of Muslims in the United States to compare the views of U.S. Muslims with the views of Muslims worldwide. The global survey of Muslims was conducted in two waves. Fifteen sub-Saharan African countries with substantial Muslim populations were surveyed in 2008-2009, and some of those findings previously were analyzed in the report “Tolerance and Tension: Islam and Christianity in Sub-Saharan Africa.” An additional 24 countries in Africa, Asia, the Middle East and Europe were surveyed in 2011-2012; results from all 39 countries are analyzed here as well as in the August 2012 report on Muslims’ religious beliefs and practices. 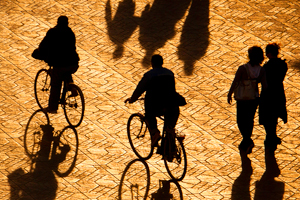 Pew Research’s global survey of Muslims is part of a larger effort, the Pew-Templeton Global Religious Futures project, which analyzes religious change and its impact on societies around the world. Recent studies produced under the Pew-Templeton initiative, jointly funded by The Pew Charitable Trusts and the John Templeton Foundation, include “The Global Religious Landscape: A Report on the Size and Distribution of the World’s Major Religious Groups as of 2010” (December 2012), “Rising Tide of Restrictions on Religion” (September 2012), “Faith on the Move: The Religious Affiliation of International Migrants” (March 2012), “Global Christianity: A Report on the Size and Distribution of the World’s Christian Population” (December 2011) and “The Future of the Global Muslim Population: Projections for 2010-2030” (January 2011). With the release of this report, we also are launching a new website for the Pew-Templeton Global Religious Futures project that allows people to explore demographic data and survey results on religion in many countries around the world. The primary researcher for “The World’s Muslims: Religion, Politics and Society” was James Bell, the director of international survey research for the Pew Research Center. He received valuable assistance from Senior Researcher Neha Sahgal, Research Associates Michael Robbins and Katie Simmons, and others listed on the masthead of this report. Leah Christian, formerly a senior researcher at the Pew Research Center, also contributed to the project. Fieldwork was carried out under the direction of Princeton Survey Research Associates International and Opinion Research Business; we particularly wish to thank Mary McIntosh and Jonathan Best of PSRAI and Johnny Heald and Cara Carter at ORB. Amaney Jamal, Associate Professor of Politics at Princeton University, served as a special adviser. In the design of the survey questions and the preparation of this report, the Pew Research Center also was fortunate to be able to call on the expertise of several other academic experts, including Asma Afsaruddin of Indiana University, Xavier Bougarel of The National Centre for Scientific Research (Paris), Michael Cook of Princeton University, David Damrel of the University of South Carolina, Nile Green of the University of California, Los Angeles, Robert Hefner of Boston University, Marcia Hermansen of Loyola University Chicago, Leonard Lewisohn of the University of Exeter (United Kingdom), Peter Mandaville of George Mason University, Vali Nasr of The Johns Hopkins University, Stephen Prothero of Boston University, Asifa Quraishi of the University of Wisconsin Law School, Farid Senzai of Santa Clara University and Shibley Telhami of the University of Maryland. While the survey design was guided by the counsel of our advisers, contractors and consultants, the Pew Research Center is solely responsible for the interpretation and reporting of the data.